Breakfast – A Healthy Pinch. This post is short and definitely sweet. I’m loving this smoothie bowl because it’s thick and creamy- perfect for a post-workout snack or even a filling breakfast. Now I’m wondering, why have I not added avocado to my smoothies before? Silly question since there are hundreds (no, thousands I’m sure) of recipes out there using them. Duh. It lends creaminess with all the good fats which result in a perfectly scoopable smoothie bowl. Almost like ice cream. With toppings, we’ll just consider this a superfood sundae! Larabars have become my go-to snack bar because they contain only handful of ingredients, all of which are completely pronounceable,whole foods and come in a variety of flavors. The only thing is they can get a little expensive so my solution is to make them at home! 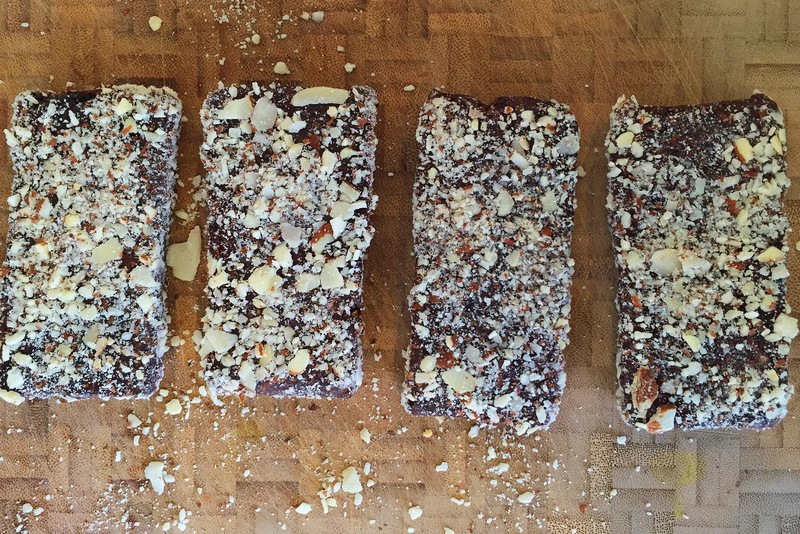 I’m always on the hunt for a new or better homemade snack bar and while I’ve made a few versions before, none really wowed me with their flavor. Except for these. These are a winner because chocolate, cherries and almonds are the three best friends that I ever did see. Weekends are for breakfasting. To me, there is nothing better than waking up, slowly sipping my coffee and preparing a meal to share with my husband. Typically this was my time to experiment in the kitchen and prior to having a baby, it could be an all-morning affair. These days, however, things are bit more hectic since we are now typically up by 5:30am with the baby, so spending a leisurely morning sleeping in is a thing of the past. I’ve come to terms with foregoing those few hours of sleep and now almost enjoy watching the sun rise. Almost. Coffee is still (and always) first on the list but feeding the baby, feeding the dog and other things tend to pop up that keep me from fully concentrating on breakfast. That being said, creating a quick meal is the new experimentation and this one totally fits the bill. I love eggs and baked eggs are a great way to incorporate tons of flavor and quite a few veggies to balance everything out. It also comes together pretty quickly, in about half an hour or so, and easily since most of the cooking time is hands-off. I adapted this recipe from Yotam Ottolenghi, but added tomatoes to give the recipe a bit more substance. 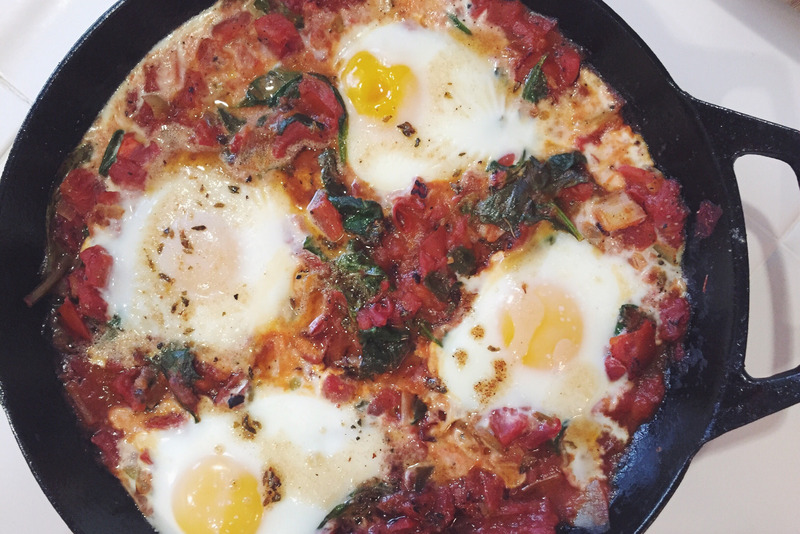 This recipe is reminiscent of shakshuka, a cumin-spiced dish where eggs are poached in a tomato sauce with onions and bell peppers. There are hundreds of variations of this dish and it’s quite forgiving to suit your tastebuds, so feel free to experiment with different spices or vegetables.